Indonesian Sop Buntut Recipe. 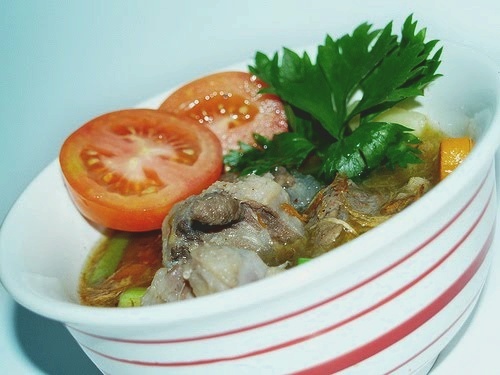 (Javanese Oxtail Soup). Fill a large pot with enough water to cover the oxtail generously and add the ginger. Bring the water to a boil, add the oxtail, and boil for three minutes. Pour out the water and discard the ginger. Refill the pot (still with the oxtail) with cold water and bring to a boil. Add the cloves and nutmeg, and simmer, covered, for 1 1/2 hours until the meat is tender. Remove from heat, cool completely, and refrigerate overnight. Skim the congealed fat from the surface. Bring the soup back to a simmer. Heat butter/oil in a pan over medium heat, add carrot, leek, and scallion and saute for 3 minutes, then add to the soup along with the potatoes, pepper, and salt to taste. Cover and simmer for twenty minutes, or until the potatoes are tender. Ladle into bowls and garnish with celery, tomato slices, and fried shallots. Note: The recipe would probably be even tastier if, before you started, you rubbed the meat lightly with vegetable oil and roasted it for an hour or so at 425 degrees, then deglazed the pan with water, used that for the soup base, and skipped the initial boil-and-dump phase.